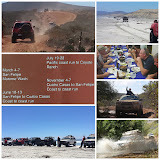 Camp4lo Baja Off Road Tours : BRONCO! Weather you are a Ford, Chevy, Dodge, Jeep or even a VW person. Broncos are cool!